The RV Kaharoa motored out of Wellington, New Zealand on October 4, loaded with more than 100 scientific instruments, each eventually destined for a watery grave. Crewmembers will spend the next two months dropping the 50-pound devices, called Argo floats, into the seas between New Zealand and Mauritius, off the coast of Madagascar. There, the instruments will sink and drift, then measure temperature, salinity and pressure as they resurface to beam the data to a satellite. The battery-powered floats will repeat that process every 10 days — until they conk out, after four years or more, and become ocean junk. Under an international program begun in 2000, and that started producing useful global data in 2005, the world’s warming and acidifying seas have been invisibly filled with thousands of these bobbing instruments. They are gathering and transmitting data that’s providing scientists with the clearest-ever pictures of the hitherto-unfathomed extent of ocean warming. 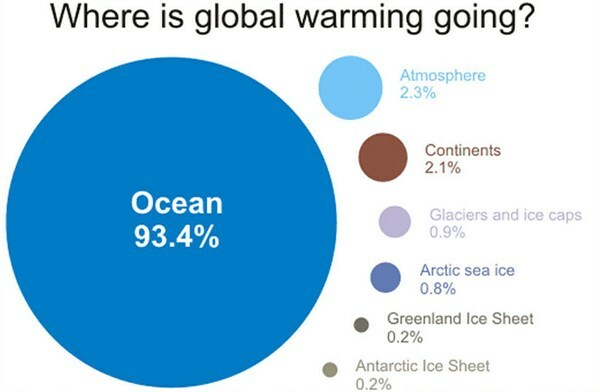 About 90 percent of global warming is ending up not on land, but in the oceans. Research published Sunday concluded that the upper 2,300 feet of the Southern Hemisphere’s oceans may have warmed twice as quickly after 1970 than had previously been thought. Gathering reliable ocean data in the Southern Hemisphere has historically been a challenge, given its remoteness and its relative paucity of commercial shipping, which helps gather ocean data. Argo floats and satellites are now helping to plug Austral ocean data gaps, and improving the accuracy of Northern Hemisphere measurements and estimates. Durack and Lawrence Livermore colleagues worked with a Jet Propulsion Laboratory scientist to compare ocean observations with ocean models. They concluded that the upper levels of the planet’s oceans — those of the northern and southern hemispheres combined — had been warming during several decades prior to 2005 at rates that were 24 to 58 percent faster than had previously been realized. That rapid ocean warming has consequences for the Earth’s climate and its shorelines. “We continue to be stunned at how rapidly the ocean is warming,” said Sarah Gille, a Scripps Institution of Oceanography professor. Gille was not involved with this paper, nor was she involved with a similar one published Sunday that examined the role of ocean warming in rising sea levels. She described both of them as “tremendously interesting” studies. Ocean warming is exacerbating flooding caused by the melting of glaciers and other ice. Seas have risen 8 inches since the industrial revolution, and they continue to rise at a hastening pace, worsening floods and boosting storm surges near shorelines around the world. Another 2 to 7 feet of sea level rise is forecast this century, jeoparizing the homes and neighborhoods of the 5 million Americans who live less than 4 feet above high tide, as well as those of the hundreds of millions living along coastlines in other countries. 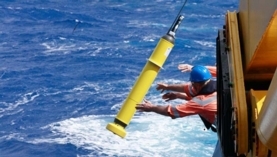 The other ocean temperature study, also published Sunday in Climate Nature Change, used Argo and other data to tentatively conclude that all of the ocean warming from 2005 to 2013 had occurred above depths of 6,500 feet. During the same period, the Jet Propulsion Laboratory scientists who wrote the paper concluded, the expansion of those warming waters caused a third of the planet’s 2.8 millimeters of annual sea-level rise. Steve Rintoul, a researcher at Australia’s Commonwealth Scientific and Industrial Research Organisation, or CSIRO, said findings of ocean warming above 6,500 feet in the Jet Propulsion Lab’s study explain the recent slowdown in warming at the Earth’s surface, which is sometimes called global warming hiatus, or warming pause. That extra heat isn’t expected to swim with the fishes forever. Some of it will eventually rise from the deep, raising temperatures in places that more directly affect us landlubbers.